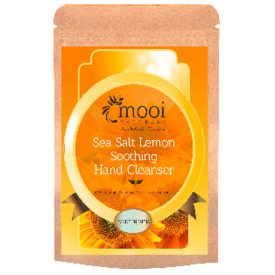 An antiseptic salt cleanser that not only cleans effectively, disinfect any wounds sustained but also removes caked-on dirt from hands. The lemon is anti-bacterial, the lavender is healing and anti-bacterial, while the geranium is soothing to the skin. Moisten hands with some milk or shampoo water for about ten minutes. Massage about a teaspoonful of the scrub gently into the skin, making sure it gets into all the rough bits and leave it for a minute or two. Then simply rinse off. There will be some oil left behind on the skin so you shouldn’t need much moisturiser, if any. Follow pampering your hands with a good hand cream. Recommend carrying out these steps no more than twice a week. An antiseptic salt cleanser that not only cleans effectively, disinfect any wounds sustained but also removes caked-on dirt from hands. The lemon is anti-bacterial, the lavender is healing and anti-bacterial, while the geranium is soothing to the skin. Directions of Usage: Moisten hands with some milk or shampoo water for about ten minutes. Massage about a teaspoonful of the scrub gently into the skin, making sure it gets into all the rough bits and leave it for a minute or two. Then simply rinse off. There will be some oil left behind on the skin so you shouldn’t need much moisturiser, if any. Follow pampering your hands with a good hand cream. Recommend carrying out these steps no more than twice a week. All of Mooi Naturals products are vegan and cruelty free and do not contain either synthetic ingredients or ingredients of animal origin.